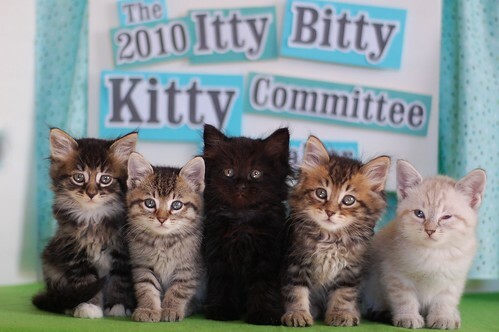 The Itty Bitty Kitty Committee: The Whole Brood and YAY! Another Matching Challenge!! The Whole Brood and YAY! Another Matching Challenge!! Well our superhero, Cynthia Suprenant, has offered up another AMAZING matching donation challenge. Just like last Friday,, she'll be matching all of our donations, until they reach $1000. That's right,,,for every dollar we donate, she'll be donating a dollar too !!! So, here's a chance to double your dollars, and help turn ONE squillion into TWO squillion!!! Challenge goes until noon Pacific Time, so we've got three hours to make this happen. Last week, we did it in a little over an hour, so three hours should be PLENTY of time. Thank you Cynthia, for your generosity. And thank you too for inspiring others to give too. AND thank you others, for giving too! What an amazing community this is !!! To double your donation dollars,,, click HERE. Now off to make my pledge. How could I not donate? Such a gorgeous group of girls. Wow. I vote to give Cynthia naming privilege. Sisters? They're doing it for themselves! Standing on their own four feet, and ringing on their own bells! I love these kittens, especially sweet little Tiny Tabby. And Tabby #3 with her mittens and her demure tail wrapped around herself! (Just like my Colby does.) And Floofy, because floofy black kittens are amazing even though they don't photograph well. And Tabby #2 wit her beautiful color and friendly expression. And the sweet little Lynx point who's going to grow into a stunner, and then everyone who meets her will have a laugh at her chubby baby photos. (I guess I love them all.) Lynxy seems squinty in all the pics, though, is her eye ok? She's just got a weepy eye which will be fine after a couple of days of meds. Gosh, I love these girls! One think that's particularly beautiful: the 4 with pink noses are ALL outlined with black. I always love that. It'll make them extra pretty when they grow up! And I love Tabby #3's "worried" look. I think it's just the shape of her eyeliner, but still, she always looks so concerned!! Hmm, is it just me, or does Floofy Girl look like a "Cynthia"? little lynx point! her coat is such a pretty cream color, it reminds me of vanilla ice cream. i bet she would fit right into one of those big waffle cones. that would make for such a cute picture! Add me to the voices worried about Lynxie's eye. I hope she's OK! #3 looks like Benny Musselman! Oops I mean Tabby #2 looks like Benny. Oh what beautiful kitties! I love it when you get the group photos. I just want to take them all home. This would be to the delight of my one kitty and to the dismay of my other. Oh well, I can dream can't I. The kitties are so beautiful!!! Pretty maids all in a row--the Supreme Sisters Suprenant! I love the tabby gurlz...but Miss Lynx and Sneaky Ninja are stealing my heart!! Wow, Lynxie has major personality!